We are the people to call when you want to have a patio / lanai installed in the Nashville TN area. Three videos below of our patio projects. In the above photo we designed and installed the patio. We are patio builders who will design your space in Brentwood, Franklin, Nashville, Nolensville, Smyrna, Murfreesboro, and Spring Hill. Photos of Patios from the Nashville TN area. We can help you with your Patio Design and Installation. Patio Design with natural stone is our specialty, Ashlar, Flagstone, even different grout colors to enhance the appearance of the stone. Your Natural Stone patio should be sealed after installation please ask us how we can help you have the patio of your dreams. One of our services is design, we offer patio design services which include a web page where you can see how the project will look. Another of our services is design consultations where we offer design advice on your property. A free quote is always available and in many cases we can gather the information from you and give you a range of pricing right over the phone. Flagstone is one of the products that make Tennessee so special. There aren’t many places in our country where the stone is so dense and colorful. Having real Tennessee flagstone installed at your home benefits your fellow Tenneseans who work hard to harvest this product. 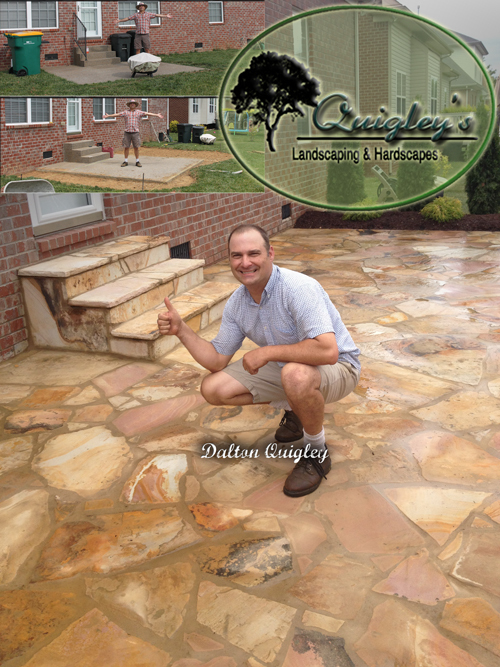 Support the local economy by buying real Tennessee flagstone for your next patio. 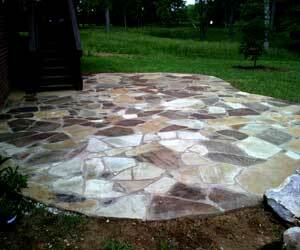 See a Flagstone Patio Project in Brentwood Tennessee. 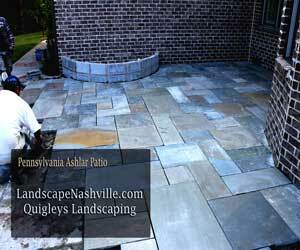 When the stone is harvested in Middle Tennessee the most dense is the gray flagstone. This makes it in high demand for patios because of the long lasting nature of this well put together stone product. 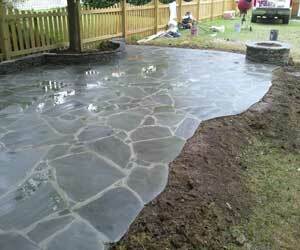 When the gray flagstone is wet it looks kind of like slate but it dries to a light gray flat look. Great as a contrast to brick, you will love your new gray flagstone patio. This product is not always available and if it isn’t we may have another that is similar. Oklahoma flagstone comes from Oklahoma and has a rich brown color blended into the mix of tans and can even come with a little bit of a glittery look to some of the pieces. Call us and we will let you know if Oklahoma flagstone is available. We have very many choices in colors, and textures of stamped concrete and overlays. Our stamping process can give you a real stonelike look. Every stamped concrete patio and walkway is given a coat of sealer to protect the color. 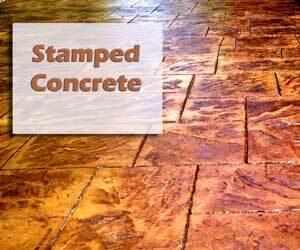 Visit our Stamped Concrete Page. 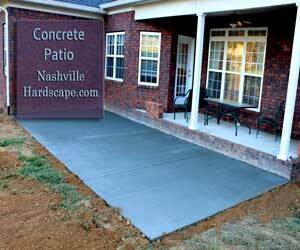 or Visit our Nashville Concrete Patio Page. Broomed concrete or what some call a cement patio is by far the lowest cost type of patio surface to have. If you are looking for pure function and aren’t worried about aesthetics then you should look into pricing a broomed concrete patio with us. Did you know in order to make a flagstone patio there is a layer of concrete beneath the stone so it is basically like making a plain concrete patio and then mortaring the stone on top. This is one of the factors that accounts for the difference in pricing. Look for the contact link in the main menu above to get in touch with us for an estimate on a broomed concrete patio. With a range of paver providers for our installation service we are free to use several different manufacturers like Belgard, Pavestone, Tremron, and more. If you need pavers for a driveway, patio, or walkway we have a few to choose from. Did you know that pavers can look like stone? Or did you know pavers can be used as a border to a stone patio, well yes they can. See Paver Patios at our Paver Patios Page! 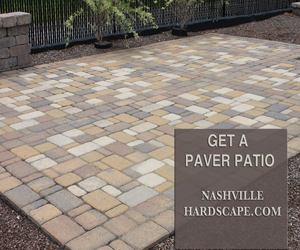 When you are looking to build your Nashville Patio give us a call, we can also help with patio restoration, patio repair, or patio renovation. You may want a fire pit, arbor, or even some stone walls as seating for guests. We will visit with you and help you decide on the materials for your patio as well as provide you with a price for your completed project. Patios are hard surfaces we use to entertain on, cook on, play on, and even relax on. A patio is custom to the person and uses you want it for. Many different materials can be used to make patios and each has its pros and cons. For cost effectiveness a plain brushed concrete patio will be your best choice. 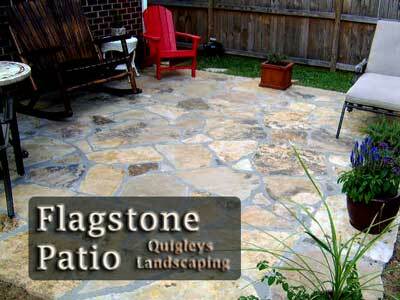 For a relaxed feel flagstone used as a patio will work best. If you are going for a formal environment you will want clean lines and symetry. For a more organic feel allow the curvy lines to roam and use more natural materials. Call us and soon you will be stepping out onto your new patio made to your taste and style. of the Middle Tn area. Where to go next to learn about us.